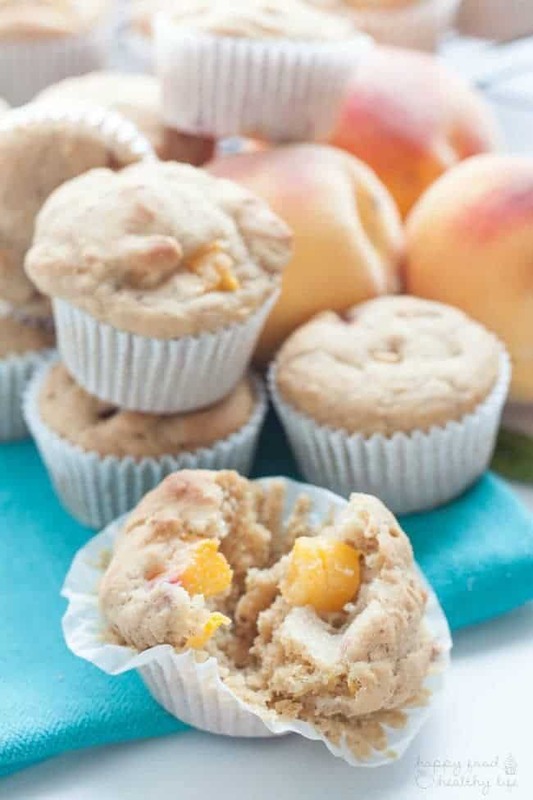 These Whole Wheat Healthy Peach Muffins are a healthy breakfast or snack recipe that’s perfect for when you’re in a hurry and just need to grab something and go. And there’s no added sugar, which is a definite plus! This recipe uses one of my most-used pantry staples. Make sure you grab my free guide to find out what the other must-haves are for your kitchen. I feel like I’m totally late to the peach game. Everyone has moved onto apples and pumpkins and I’m all, “hey wait guys! I still have some peaches left for you!” I know, the peach season has pretty much dwindled down, but I’m still seeing the last of them sold in markets. 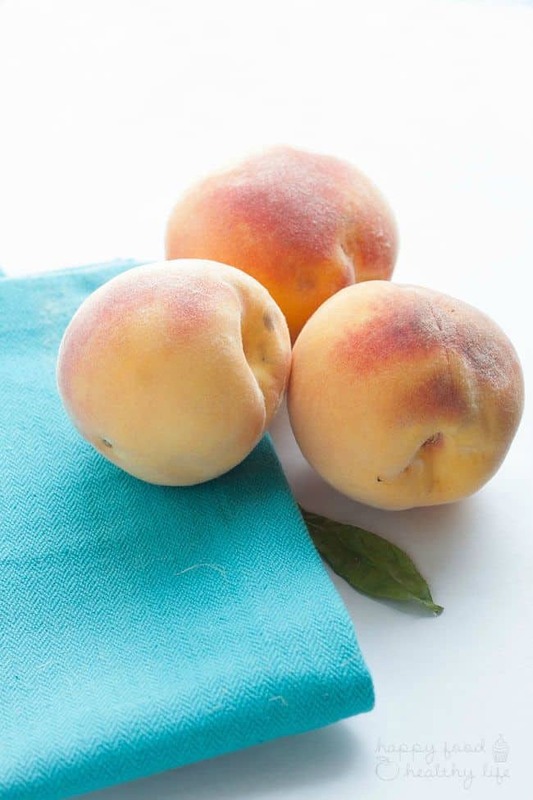 Besides, there are always the peaches you have canned and will be able to use all winter long. So, I promise you, there will be plenty of apples, pumpkins, and squash. But before then, I still have a little “end-of-summer” to wrap up, even though this is technically the first week of autumn. Just bear with me! 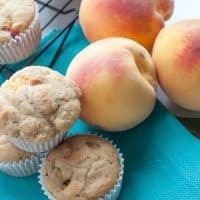 I actually made these muffins about 3 weeks ago when I ended up with a huge box of peaches from the local farmer’s market. 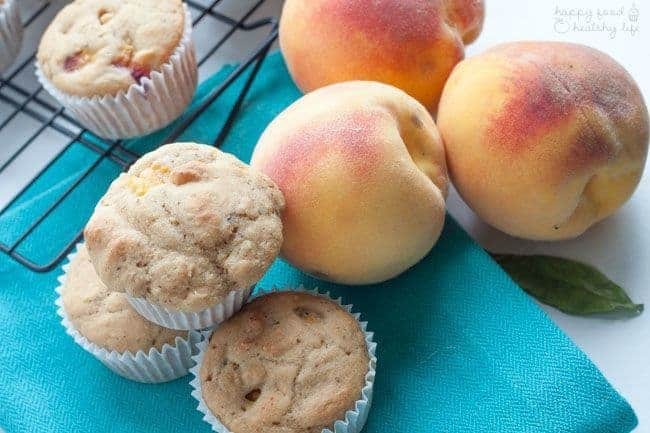 I also made a few other peach recipes that didn’t end up “blog-worthy,” but these muffins TOTALLY made the mark, and I’ve just been waiting for the right time to share them. Between my birthday, my son’s birthday, and about a billion other September events, life has just gotten too crazy. And there may have been a time or two when I ate too much birthday cake, too many peanut butter bars, and one too many cocktails. And although I’ve picked myself up each and every time, I can’t lie and say that it hasn’t been hard. The struggle has gotten in the way of blogging and the ability to be around food as much as I have been able to in the past. Looking at myself and thinking, “Why are we here again? Why is food still a struggle?” It just frustrates me to no end. But I also know that it’s part of the process. I know that food will probably always be something I have to be very conscious about. It’s a very slippery slope for me. It may start out with an indulgent birthday weekend, and the next thing I know, I’ve eaten an entire pan of peanut butter bars. No joke. But here’s the thing. Here’s the part where I can realize that I’ve come a long way. And here is how I know I can help others who struggle with food. Four years ago, those peanut butter bars would’ve put me over the edge. They would’ve sent me into a full depression and I would’ve spent the next week living on lettuce and vegetable broth. Now, the place where I am today. I’m able to recognize it for what it is and move on. Yes, I ate more than I would have liked to. No, I wasn’t eating foods that made my body happy. No, I wasn’t listening to my body when it said “no.more.sugar!” I was going against every single thing that I teach others. And that is ok. I am ok with that. Because I am human. I make mistakes. I am not perfect. And that is okay. Yes, it’s frustrating that I got to that point. But today, I’m moving on. On to healthy food. On to food that my body needs and wants. Foods that are still healthy and delicious all at the same time. 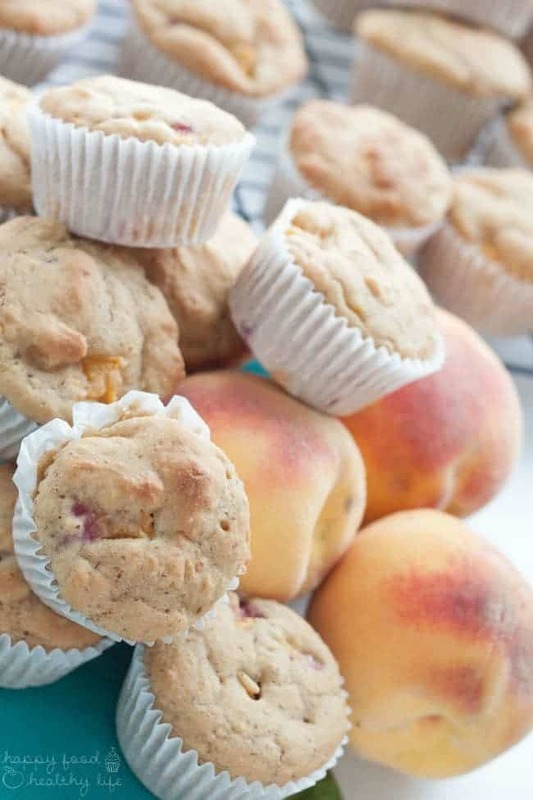 And that is where these peach muffins come in. I will not wake up this morning and grab a peanut butter bar, handful of chips, or a spoonful of ice cream. I will nourish my body with these sweet and delicious muffins. Even though I made them weeks ago, I froze half the batch and had them ready for when I would need the health, nourishment, and convenience of a quick breakfast. And this my friends is the time for that. In a hurry and need a healthy snack? 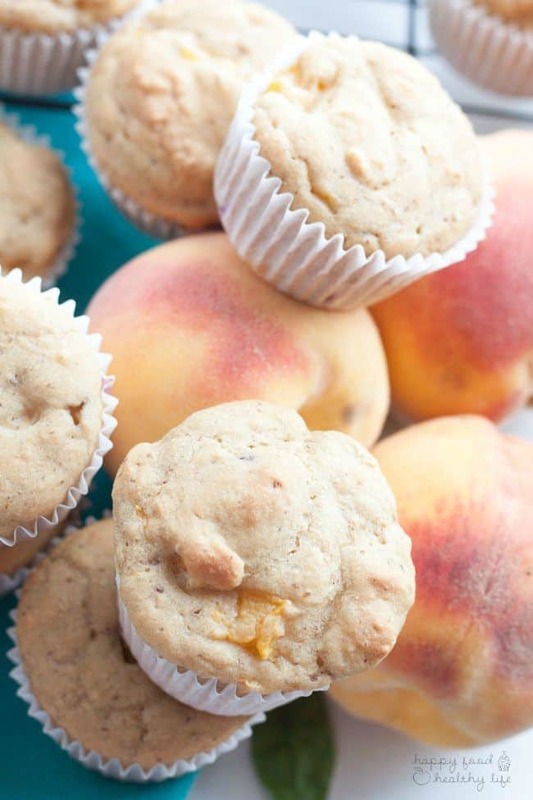 These WHOLE WHEAT PEACH MUFFINS are for you! In a small bowl, combine ground flax and water and set aside. In a medium bowl, whisk together the flour, baking powder, baking soda, and salt. In a large bowl, whisk together the applesauce, flax+water mixture, and vanilla. Stir in the honey and yogurt, thoroughly mixing until no large lumps remain. Alternate between adding the flour mixture and the milk, stirring just until incorporated, beginning and ending with the flour. Gently fold in the peaches. Divide the batter between the prepared muffin cups, and bake at 350°F for 29-33 minutes, or until a toothpick inserted into the center comes out clean. Cool in the pan for 5 minutes before carefully turning out onto a wire rack to cool completely. Don’t forget to stock your pantry with these 10 must-haves for a healthier kitchen and life. I love your honesty! So many of us have similar struggles and can relate to everything that you are going through. We’ve all had our version of the peanut butter bars! These muffins look like the perfect solution to satisfying a morning sweet tooth yet still staying healthy. YUM! I’m also looking forward to your pumpkin and apple recipes! Yes! And that is why I vow to talk about it. Because everyone has been there, yet it can feel like such a lonely place when you’re in it. I hope to start erasing the shame behind the food struggle. I can relate to this post more than you know… so grateful each day is a new day! Thank goodness, right?! I think a lot of people can relate but just don’t want to admit it because unfortunately, there is still something that makes women feel shameful. Talking about it will hopefully help others realize they are not alone when they’re feeling crazy around their version of my peanut butter bar story. Your muffins look absolutely perfect however I just made them and followed the recipe exactly to a T and they did not cook through. The tops get dark, middle stayed soft and mushy and they are all sunk inward. What could have happened? Is there any way this recipe is off? WHat did I do wrong? I’m so sad! It was supposed to be breakfast. I still have half the batter left since I did only one pan. Is there something I can do to fix what is left? Hi Jennifer! I’m so sorry your first batch didn’t turn out. I looked over the recipe and everything looks to be on point. The only thing I can think of is if you used regular whole wheat flour instead of whole wheat pastry flour. That would make the dough too heavy, which I think would explain the sinking inward. I’m sorry I wasn’t any more help. I’ve had great success with this recipe. Good luck!